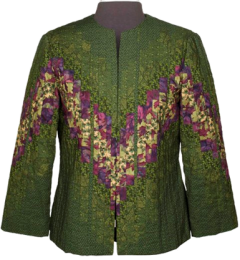 In this class students will create their own unique bargello jacket using 7 different fabrics. We will learn the basic techniques for creating bargello with tube construction, and how to use this to design our own unique figure flattering quiltwear. These jackets are beautiful. 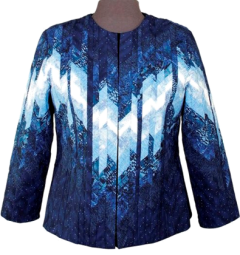 Midnight Glacier or Purple Garden Pattern & fabrics should be purchased prior to class. Page 1 and 2 of Jacket pattern completed before class.